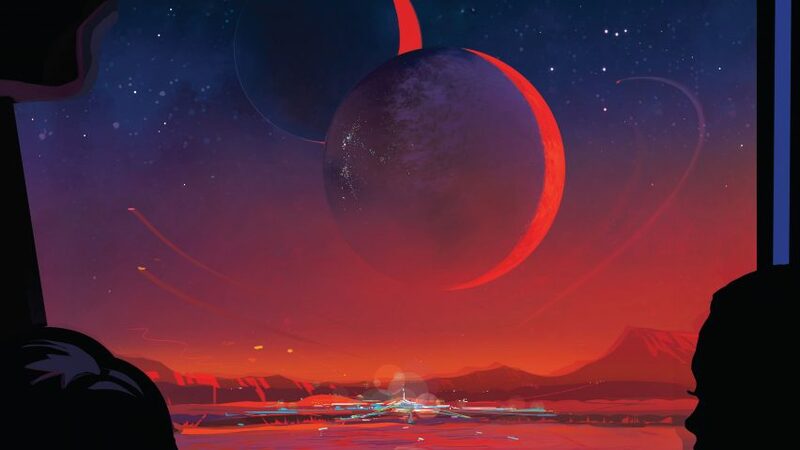 NASA has celebrated the discovery of seven planets orbiting a single star, some of which could potentially support life, by adding to its collection of posters advertising other worlds as vacation spots. The set of rocky planets that form the TRAPPIST-1 system are all a similar size to Earth, and are clustered around a dim red star "like a family around a campfire". This is the largest batch of Earth-sized worlds around one star to be discovered by a NASA telescope. Following the announcement during a press conference yesterday, the American space agency's Jet Propulsion Laboratory released the poster promoting a planet-hopping excursion through the system, as each of the worlds are a relatively short hop from one another. The poster depicts a view from a passenger vehicle, which includes a sci-fi architectural complex on the planet's surface and the other celestial bodies clearly visible in the sky. "Some 40 light-years from Earth, a planet called TRAPPIST-1e offers a heart-stopping view: brilliant objects in a red sky, looming like larger and smaller versions of our own moon," said NASA. "But these are no moons. They are other Earth-sized planets in a spectacular planetary system outside our own." The system was revealed by the TRansiting Planets and PlanetIsmals Small Telescope (TRAPPIST) and NASA's Spitzer Space Telescope. Three of the planets in the system – including TRAPPIST-1e – sit in the habitable zone around the star, which means they should have the right conditions to support life. "Any of them could harbour liquid water, but the planet shown here, fourth from the TRAPPIST-1 star, is in the habitable zone, the area around the star where liquid water is most likely to be detected," NASA said. The graphic is designed to mimic the style of posters released during the early 20th century to entice travellers to exotic locations around the world. The Jet Propulsion Laboratory also released an artist's impression of watery, rocky landscape of TRAPPIST-1f to coincide with the announcement. Although the TRAPPIST-1 planets remain out of reach for the foreseeable future, space tourism is near to becoming a reality. Last year, Virgin Galactic unveiled an updated version of its commercial SpaceShipTwo craft that would take passengers beyond the Earth's atmosphere.